Accreditation assists nbn to verify that works have vital skills and competencies to carry out work on the nbn™ network in a safe and environmentally responsible manner. All workers involved in network construction, operation, activation or maintenance activities will need to become nbn accredited. Technical skill accreditations: Relate to tasks that require specific knowledge and skills in order to be competently performed. Health, safety and environment (HSE) accreditations: Relate to important HSE requirements that are relevant for work on the nbn™ network. 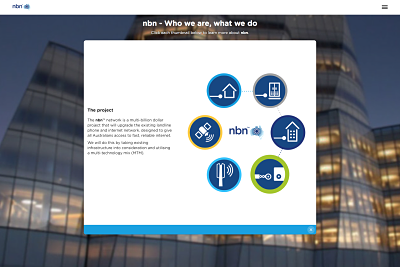 nbn: Your role in connecting Australia - An overview of nbn as an organisation and how to represent the nbn™ brand. 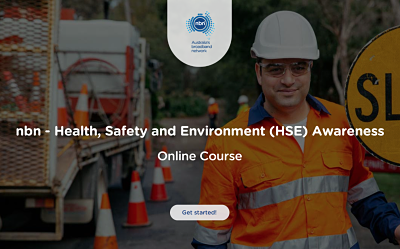 HSE Awareness - An overview of HSE risks and hazards specific to working on the nbn™ network. Workers commencing work on or after 1 February 2016 will need to complete nbn online training before they start work. Those already working on the network as at 1 February 2016 will have until 1 May 2016 to complete nbn online training.